Easy and flavorful Slow Cooker Chicken Marsala in a savory sauce filled with mushrooms and garlic! 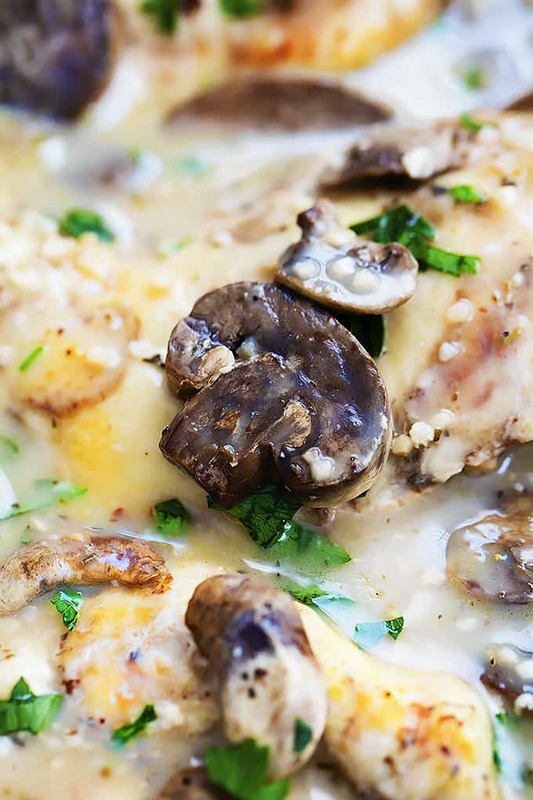 Loving this super easy Slow Cooker Chicken Marsala? You’ll also want to try Sheet Pan Balsamic Chicken with Potatoes and Carrots, One Pan Garlic Herb Chicken and Asparagus, and Healthy Slow Cooker Chicken Cacciatore. Thank the heavens above it’s Sunday. If we’re being 110 percent honest, this weekend has not been my favorite. Sometimes stupid things happen and when all is said and done, it just bites. Let me tell you a very quick, watered down story about my Saturday morning. Our new fridge (a story in and of itself) has a shelf in it that was just the right height to push on the lever for our 2-gallon water jug. We didn’t realize this of course. So we grabbed a glass of water before going to bed on Friday night, like we always do, enjoyed a few re-runs of Last Man Standing, and slipped into a blissful, ignorant slumber. Meanwhile, back at the fridge, water leaked all over our wood kitchen floor all. night. long. and the next morning we discovered a very soggy, very warped floor. It could be worse. It’s not the end of the world. But It still hurts to realize your just-barely-finished kitchen (seriously. the day before you guys, the day before…) remodel is now expanding. Gahhhhh. So close, and yet so far. 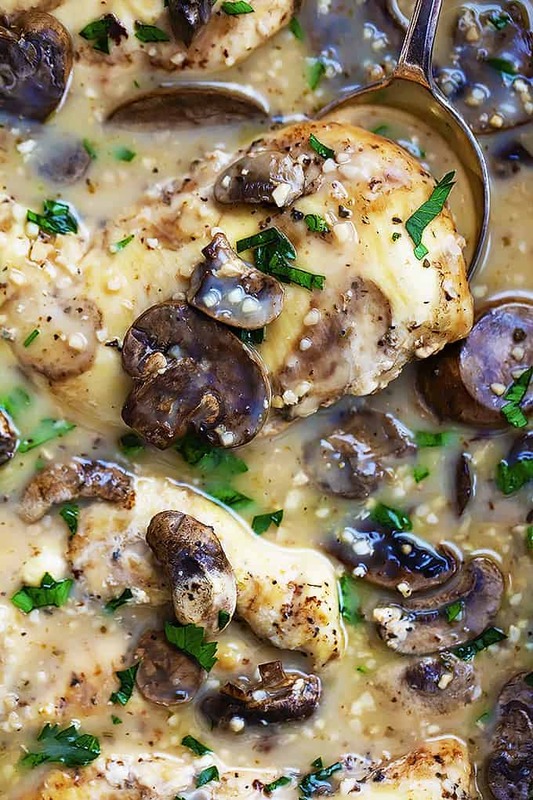 On a much, much happier note —> slow cooker chicken marsala! This stuff. It’s SO good! Incredibly easy with just a few minutes of prep and that creamy sauce is heavenly. It’s easy peasy and crazy delicious meals like this that get me through stressful weeks. I could use a few more like this after our kitchen disaster. Good thing my husband was as big of a fan of this chicken marsala as I am because it’s going right back on the menu this week! 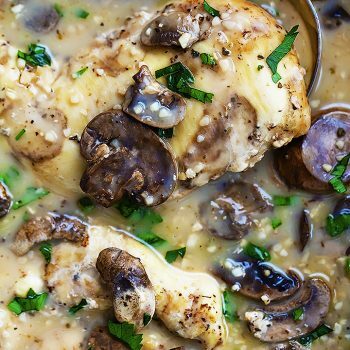 Easy, and flavorful Slow Cooker Chicken Marsala in a garlic and mushroom marasla sauce! Lightly greasy your slow cooker with nonstick spray. Season chicken with salt and pepper and place in the bottom of your slow cooker. Use a slotted spoon to transfer chicken to a plate. Whisk together water and cornstarch til dissolved, then pour into slow cooker and stir. Add chicken back to slow cooker, switch heat to high, cover and cook another 20-30 minutes until sauce is thickened. Taste and add salt and pepper as needed. Sprinkle with parsley and serve. Recipe slightly adapted from Tablespoon. Try these other Slow Cooker Recipes you'll love! Yummy!! This looks good!! And I’m sorry about your kitchen.I’ll be praying for ya’ll! I made this for dinner today. I substituted the water & cornstarch with 2 tbsp. softened butter & 1/4 c flour creamed together and whisked into the sauce. This mixture gives you the shiny rich sauce I get when I make pork marsala. I may try pork in the crockpot, too. So sorry about your kitchen! This is AMAZING!!!!! Omg so much flavor! And so easy and simple. A keeper for sure. Seems to me you have technical problems with your website. Very slow to load. Also, why does it print “Follow on Pinterest, Follow of Ffacebook, etc.” on the bottom part of the recipe sometimes blanking out the bottom two lines. Wouldn’t be a bad idea of giving the viewer the option of not printing the photos in the menu instructions. In spite of all these difficulties, will try this dish very soon. Sounds good and easy. Such a bummer about the kitchen, but thank you for sharing this recipe. Adding it to the menu for this week! Looks delicious and so simple. Bummer is the perfect word! But it’s turning out that we might be able to keep the floors and we are soooo happy about that so all is well! 🙂 Definitely try the chicken marsala – hope you love it Eliza! It was a pretty sad thing with the kitchen floor BUT they’re drying flatter than we expected them to and they might be salvageable! Hope you enjoy the chicken marsala Ren! So sorry to hear about your floors! 🙁 I do have to say though…Chicken Marsala is my FAVORITE and it turns out that I have those ingredients already. Making this tomorrow! Hey! I’ve made this earlier and I absolutely love it! I was just wondering.. My Marsala chicken’s gravy looks slightly darker than the ones in your picture. Is there a reason for that? Also, is there something I could add to it to make it sort of like a pasta sauce? Like heavy cream? Thanks for the help!! How much cream should I use and how soon after can I put the cornstarch& water? Try using chicken broth in addition to marsala wine. Tried this recipe today and it was delish! I’m always looking for new slow cooker recipes and this one was a keeper. I couldn’t find “sweet” Marsala cooking wine. Is there a huge difference in that and the regular Marsala cooking wine? I think you could use regular and it would work just fine! Ok, trying this today My daughter found the recipe and wanted to try it. We are regular homemade chicken marsala eaters and I have never made in in the slow cooker–we do love our slow cookers. I do try marsala in restaurants once in a while and have only found one so far that meets my standards. I hope this works out well and will let you know. Many times I will make it up in the morning so that my husband could reheat it before I arrived home from wherever I may be. One thing, you can’t really substitute chicken broth for marsala wine–that is a whole different taste. The meal was great but I have a question about gravy.Is it suppose to be thick? Hi Linda, It’s more of a sauce than a gravy. Thinner than gravy you would put on mashed potatoes. Just found it and am loving your blog/website!! Trying this recipe tomorrow. What do you usually serve it with? Veggies? Pasta? Rice? Hi Elizabeth, so glad you found my blog!! This recipe is soooo yummy, we usually eat it with white rice or egg noodles – YUM! Oh no! Hopefully it is a quick repair! I know living while remodeling a kitchen is NO fun! But this recipe looks awesome Im trying it tonight! Hey Stephanie! Oh we are so grateful that the whole project is finalllllly DONE! It was a bit of a nightmare living without a functioning kitchen but now that it’s all over and done I am SO glad we did it!! Hope you love this chicken marsala!! Super excited to make this tonight! Before I head to the store I was wondering what size breasts you recommended. Wasn’t sure if I should buy the huge thick ones or more on the thinner side. Thanks! Hi Sabrina! Sorry I’m late getting back to your question but with chicken breasts I always opt for thinner ones, OR I buy really fat ones and slice them in half lengthwise to get two thinner breasts. Looks yummy! Did you use the casserole type crock pot or just a regular one? Hi just wondering if you were to ad heavy cream as someone had suggested earlier, when would you do this. I am thinking when you whisk the cornstarch and water you would add heavy cream as well. If you have any thoughts that would be great. thanks. Hi Patricia! I would add the heavy cream just before adding the corn starch slurry. We just licked our plates from this dinner. Yum! A keeper recipe for sure. I followed the recipe with the exception of a bit more mushrooms, and I added a glug of half and half after adding the water and cornstarch mixture. (A glug was maybe 1/4 cup.) Next time I think I will try to substitute part of the Marsala with chicken stock (maybe 1/3?) so the Marsala flavor isn’t quite as strong. Hi! Making this tonight! Quick question, my family LOVES chicken thighs. do you think using boneless skinless chicken thighs would work too? Also should I adjust cooking times if I browned them first? Hi Nicole! I haven’t tried it but I think thighs would work just fine! Also, shouldn’t need to adjust the cooking time if you brown them first as long as you’re just browning enough to get a little crispiness on the skin. Easy and tasty – wouldn’t change a thing! The recipe looks yummy. Do you have any idea how many lbs of chicken breast this will require? The size of chicken breasts vary greatly where I shop so it’s hard for me to know how many I actually need. Weight will be so much easier! This sounds really good! I will be making it for the first time for a potluck. Since I will have to serve it to a larger group, I plan on slicing the chicken breasts into more servable portions. Should I reduce the cooking time so the chicken doesn’t dry out? I plan on doubling the recipe basically. If you have any other suggestions since I’m doubling the recipe, please do let me know. Thank you and happy holidays! I was so excited to try this but it was WAY to strong in the wine department. I couldn’t eat it. My husband liked it though. I love the Cheesecake Factory Chicken Marsala and looking at copycat recipes of theirs it looks like they do even broth to Marsala. That would probably explain why your recipe seemed so strong. Advice to anyone that doesn’t love wine or is looking for a Cheesecake Factory type dish DEFINITELY tone down the Marsala. This is only the 2nd time ive ever used a crockpot and my chicken breast came out shredded… I’m so bummed! How do I keep it from happening next time? Hi Josie, I don’t think I’ve ever had this problem, the chicken breasts would stay in one piece unless you pull them apart! Do you think this could be cooked on high? Hi Jenna, you could cook it on high, but be sure not to cook it too long as it will dry out the chicken. This looks delicious! I will def. be trying this. Did you use regular chicken breast or the hand trimmed/half breasts? This looks delish! Can you make ahead and freeze this? Hi! I I haven’t myself but I don’t see why it wouldn’t work! Cant wait to try this for my daughter!! Do you have the nutrition numbers on this, especially carbs? Hi Marcia – I don’t have the nutrition stats on hand but when I need them I use http://www.myfitnesspal.com it’s free and so easy to use! I have this in my crockpot right now!! Can’t wait to try it!! Is there a difference in white cooking wine & marsala cooking wine? I have white cooking wine, will this work? Hi. Looks great! My husband and I have been watching calorie intake. Any idea what that might be for this? It seems like it should be pretty slim. Hi Michele! You can easily double this recipe just fine. However, I think 10 hours might be too long because it will probably dry out the chicken dang it… There’s a chance it might not if you start with frozen chicken and cook on low?? So i will be able to sub the wine for chicken broth? If so, will it taste the same? Hello. Thank you for this recipe. We just finished eating and my husband loved it. I liked it but I wanted it to taste like my favorite restaurant ( which I’m sure pan fries it and uses butter so I may be unrealistic.). What brand of Marsala do you use? Also I used baby baby bellos, would another type of mushrooms be better? I sincerely appreciate any advice you can give me. Next week I’m going to try the one pot lime chicken, that looks awesome too. Hi! I have the same question as Stacy. I’m curious what brand of Marsala wine you use? Some mentioned the flavor was quite strong – I’m guessing that might be from using different kinds of Marsala wine. I’m guessing they’re not all created equal!? I just found your website and I love that you have so many slow cooker recipes! I’m all about the slow cooker too! 😉 Thanks for sharing your talents with us! Would it hurt if the slow cooker went long than the 5-6 hours? I typically leave at 6:00 am and return at 4:00pm which would be 10 hours. I would hate to ruin it. Hi Karen! The only thing you want to be careful of is overcooking the chicken which would dry it out. Does your slow cooker have a timer? If so you could maybe delay it an hour or two. Another good idea is to try it for the 10 hours with frozen chicken breasts! I was so excited to find this recipe. Stumbled on it on Pinterest. Just made it tonight and unfortunately it was a disaster. So overcooked that I am not sure what to do with it. I cooked 5 chicken breasts, put a few extra mushrooms in , an extra 1/4 cup of marsala and put it on for 5 hours on low. I have an All Clad high end slow cooker that is only a year old. That’s it. Almost like rawhide it is so tough. Bummer for dinner when I thought we’d have a yummy meal. I’ll try again at some point, but highly recommend checking this much sooner than 5 hours. Hi Anne Marie! So sorry to hear that, this is a very popular recipe on my site and gets great reviews all the time! I’m so sad that it didn’t turn out for you – it sounds like you did everything according to the recipe so I’m not sure what went wrong!? I bet pork chops would be great! I personally would opt for boneless. Probably about the same cooking time would work! This was delicious and incredibly easy. I only had frozen bone-in chicken breasts. I made the recipe without the mushrooms and heated it on warm for 2 hours, added the mushrooms and cooked on low for 6. Fabulous. Live in the country, no Marsala available. What is the closest wine to it that I could use? Just made this dish And I used all the right things but boy was the sauce thick I had to thin it down a lot it was like paste maybe a 1/4 cup cornstarch is too much ,any one else hav this problem. I had a similar problem. My sauce became gelatinous just about ten or fifteen minutes after I added the cornstarch. Not sure what happened! Anybody have any tips? If I am making this recipe for 2 people only do you think I can use only two chicken breasts and it still turn out ok? I guess I would need to cut back the cooking time to maybe 4 hours? What are your thoughts? What type of mushrooms do you use? Fresh sliced? The look darker than canned sliced mushrooms. Please indicate recipe name in subject heading. Also, I plan on using the broth but would consider using white wine — your thoughts? Hi Joanne, You could prepare it in a casserole dish, then cover with foil and bake for probably 45 minutes at 375 degrees. Keep an eye on cooking time as I’m not positive how long it will take but when your chicken is white through the middle it’s good to go! I made this last night and not sure what went wrong but it was absolutely terrible and tasteless. I did everything according to the recipe. My husband agreed so I will not be cooking it again! Sounds like you probably didn’t add enough salt and pepper – that’s what really brings the sauce to life! The same thing happened to me. While I’m not happy that it turned out badly for you, I’m glad to see that I’m not the only one who had this problem. I don’t think it’s the salt/pepper in my case, cause I added tons. I was actually worried it would come out too salty. Hi! Can I use frozen chicken? Would adding cream of mushroom soup affect the recipe In a negative way? What exactly is Marsala wine? Can you email me the exact name of wine you use. Thank you. This is a great recipe, perfect as is. Thank you! Imade this and the sauce never thickened at all. I Added the corn starch/ water mixture and cooked on high another 30 minutes and it was still really runny. Any suggestions? I love Chicken Marsala! I was introduced to this wonderful dish in a small family owned restaurant in Miami. In talking to the owner about his recipe, he said the key to his was dry Marsala wine. Most every place I’ve had this dish used the sweet Marsala wine. My question is, have you ever tried making this with the dry instead of the sweet wine? What if I am using 2 chicken breast and only had a 1/4 or so of marmalade wine. Can I make the rest up with chicken broth? I kinda already threw the ingredients in. How much heavy cream would i use if I wanted to make it more creamy? How can I make this in my Instant Pot? Hi Nanci! Not sure what an “instant pot” is?? We enjoyed this. Didn’t have marsala wine so I used chicken broth. Easy and good! I am very excited to try this! Looks delicious! Crockpot recipes are my absolute FAVE!! I’m trying this tomorrow. Should I cook for 5 or 6 hours? thanks! I’m not sure if I did something wrong but I found this to be really meh. Some of the chicken got really tough, and the sauce was fine, but not great. Not sure if it was my crockpot or if this really just isn’t that great a recipe. That said, it was really fast to put together, especially since I bought pre-sliced mushrooms. Otherwise this was only okay. Hi, would i be able to mix this all up and then freeze it? Do you think it would keep well? How many calories is in one serving do you think? I see it serves 4 but I can’t find the nutritional information! Thank you! How’s many calories do you think is in one serving? I see it serves 4, but I can’t find the nutritional information. Thanks! Hi Nicole, yes I did! I love using my casserole slow cooker!! Works great for this recipe and most of my other slow cooker ones! I would just like to tell you how much we enjoy this recipe! I have made it multiple times, and usually it gets cooked until the meat falls apart, but it is absolutely delicious! We serve it over mashed potatoes. Also, leftovers freeze like a dream! By far, this is the best slow cooker meal I have ever had or made! I could only find a dry Marsala wine, will this work? Should I add a pinch of sugar? I made this for “Slow Cooker Sunday” and it was really good! I served it with some egg noodles. I thought the chicken came out a little dry (the problem with breasts in the slow cooker), I’d love to convert this to my pressure cooker for a mid-week meal! If I put the cornstarch slurry in right away, will the sauce be too thick? I really need to set it and forget it while I’m away at work and come home to a prepared meal. Thanks! This is SO GOOD! I just got a new slow cooker and was a wee bit nervous because my old one was so hot that it turned everything into jerky. But this turned out perfection! I did substitute skinless boneless thighs instead of breasts and had to cook on high due to time constraints and we loved it. Chicken was tender and the sauce was delicious. Definitely don’t go light on the salt … it needs it to give the sauce a fuller flavor. Le Creme de la Crumb is my go to for good recipes and you didn’t disappoint. Delicious! How long did you cook it on high? Tiffany, Do you use jarred minced garlic, or do you mince fresh garlic? Hello! This lovoks fantastic – going to try today, and have a question about the Marsala wine. Is this a true wine you’d fine in the wine section of the grocery store, or the ~fortified Marsala usually with oils and vinegars? I got the latter for another recipe and was surprised by the salt content (and ended up being pretty sure the recipe had not meant that kind of Marsala!). Thank you! Could you cook this on high in in the slow cooker? And if so, how long? Perfect Valentine dinner -delicious! Low cal & no carb too. Tweaked it by using 1/4 cup chicken broth + 3/4 cup Marsala. Mixed cornstarch with 0 fat half & half to make it creamier. I love slow cooker recipes!!! I work at night and anything I can leave for my husband in the crockpot saves us both so much time and stress. I had my husband finish the recipe (steps 3&4). He said the taste was amazing but it turned into a paste after adding the water cornstarch mixture. Any suggestions to keep the sauce thinner? I served mine over pasta but it would be great with garlic mashed potatoes as well. I also threw together a quick Caesar salad. I made this last night (with a few adjustments for my particular preferences) and it turned out great. For the people saying the alcohol taste was overwhelming, I was worried about that too. I browned my chicken breasts before I put them in the crockpot (because it makes them prettier) and then I deglazed my pan with the Marsala and let that simmer for about a minute to let the alcohol evaporate. I also used half wine and half chicken broth. I cooked out the alcohol, added the chicken broth and simmered that down for about a minute. Then I added two tablespoons of butter to it and poured it over the chicken and mushrooms. It turned out wonderfully. OMG!!! 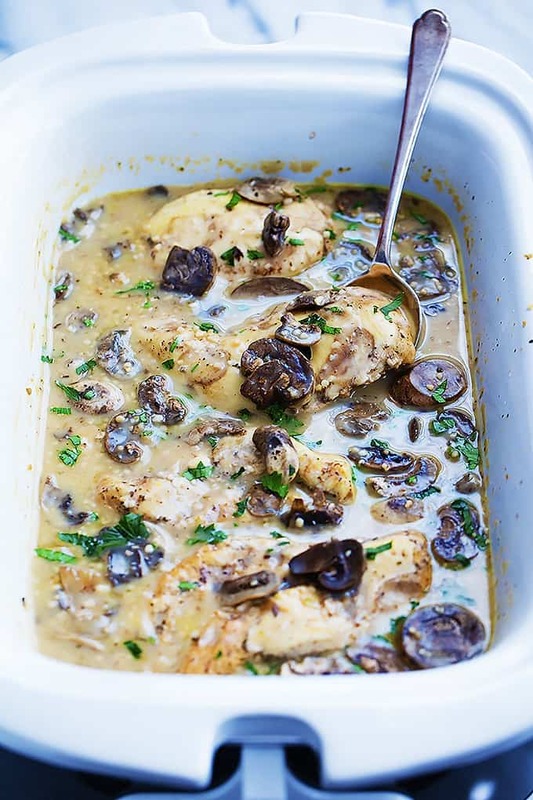 This Chicken Marsala is looking amazing, this recipe rocks. Thank you for sharing this delicious dish with us. I made the Chicken Marsala for 10 guests and everyone loved it! They kept complimenting how great it was! I meant to buy chicken breasts but grabbed chicken thighs and I’m glad I did! So good! Good mistake! 😉 Glad that you loved it, Gwynne! Tiffany, this recipe is absolutely awesomely yummy!!!!! Thank you so very much for putting this recipe out there for people like me!!!! Have a great day, and please continue with receipts such as this!!! Made the chicken masala per your recipe, OMG!! !, this is the best ever! !, and super easy, I absolutely love easy, well, I’m a man!!! Just wanted to say thank you, thank you!!! Your comment cracked me up! 😉 So excited that you love this chicken so much! Thanks for sharing you’re awesome feedback, Jerry! this was far too starchy. I would recommend using cream to thicken instead of the 1/4 cup starch and water mix. This was a hit Tonight for dinner and will go into the menu rotation for a while! I used sliced mini BabY porTobello muShrooms(they hold up better in the slow coOker) extra garlic and herbs and added fresh tyme while cooKing. So good and so easy! Lori- thanks for your feedback! Happy to hear that you enjoyed this enough for it make the rotation! What size crockpot should be used? I have a 5-quart. Also, can leg quarters be used instead of breasts? Hi Kim- I typically use an 8 qt but I think you should be fine using a 5 qt for this. I haven’t tried this with leg quarters, so I can’t speak for sure but I think it could work. Imade this to tonight on my my stovetop. Delicious! Thanks for sharing. Great job, Trisha!! Excited to hear that it turned out well on your stovetop, too! This was so simple. We served it with some mashed potatoes. Super quick and easy weeknight meal. Fantastic idea, Amanda! Thanks for your feedback- super excited to hear that you enjoyed this recipe! 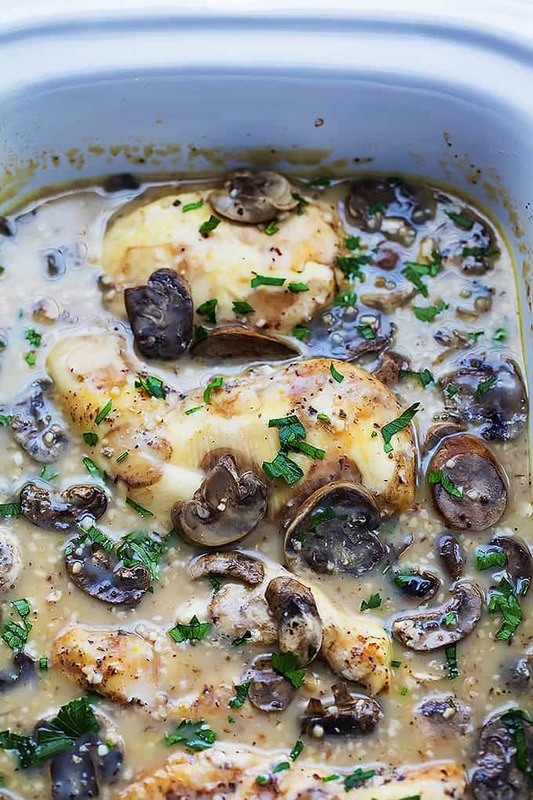 Would love to make this recipe but would like to know if I can substitute the fresh mushrooms for a can of cream of mushrooms. Thanks! Hi Ana- I would highly suggest fresh mushrooms over a can of cream of mushroom soup! Thanks for your input, Tonja!